The property was beautiful! Loved the windows looking Out to the plaza de signoria . Amazing location! Barbara was wonderful meeting us & explaining the property. We would definitely recommend this place and stay again. We are a family of two adults and a teen who stayed comfortably for two nights. Tremendous location, steps from the Ufizzi Gallery. Meeting Barbara was easy and smooth; we were able to drop our bags and get our keys early. The view is amazing. The piazza is lively on weekend nights until quite late, so we needed to close the windows for quiet. A great option for a couple or small family looking for a studio apartment right in the middle of Florence. Unreal. This is Firenze. Beautiful & Amazing. Wish we were still there! OMG! I lived in Florence 25 years ago and have not been back since. Oh, how I have missed this city. Though I thought I wanted to stay with a view of the Duomo, those buildings are older with small rooms and not great value. This apartment was just amazing. High ceilings. Beautiful décor and amenities, including great WiFi and A/C. Great to have a reasonable size elevator in this old building - made moving luggage very easy. Giant Florentine windows opening out to this gobsmacking view of Palazzo Vecchio and Piazza della Signoria. Words do not do it justice. Though pricier than a random pensione around the corner, if you only spend a couple of days in Firenze, then do it here. This view is what this city is all about. Makes you feel almost like a Medici. Ms. Barbara had excellent restaurant suggestions at check-in and made the entire process very easy. One important note- if you need a taxi, especially in high season, you must book it at least one day in advance, tell them Piazza della Signoria al'angolo con Via Calzaiouli. Walking distance to everything. Beatiful views at day and night, great coffee maker. Great shower. Only drawback was that the quality of the bed mattress was not up to the quality of everything else in the apartment - it sagged in the middle and was a little smaller than we would have ideally liked. However, we nevertheless wish that we were still in the apartment right now! Stay here! You will not regret it, and you will get the true feeling of staying in Florence! 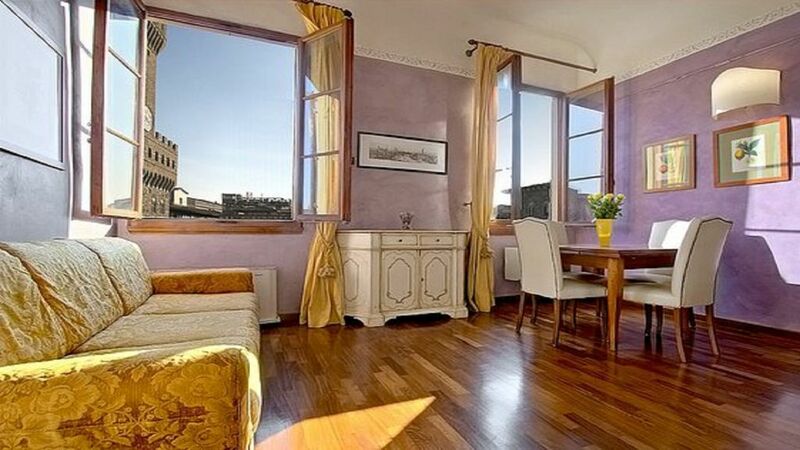 Great location on fourth floor overlooking Piazza della Signoria. Everything went well with check-in process - Mrs. Barbara was very helpful. We enjoyed our time in Florence but are hoping to be able to return to see more of it, and would love to stay here again. Superb location and an ideal apartment for visiting couples, all of Florence is on your doorstep. From the windows you look out over the Piazza della Signoria, the Palazzo Vecchio, Neptune's fountain and the Loggia dei Lanzi...so after a few hours in Florence's museums and galleries or shopping for local leather goods in the markets you can just sit back in the comfort of your own home from home and enjoy the view. The apartment is nicely furnished (tasteful and good quality), has high ceilings throughout and a decent sized shower with plenty of head room (something of a novelty in some places). The kitchen was perfect size for arranging breakfast of fresh fruit, pastries and fresh ground coffee from the Sant'Ambrogio market, or pouring out a sumptuous glass Chianti in the evening. The wifi worked well so we were able to check museum opening times, restaurants etc on our laptop. We had a warm welcome and a fuss-free check out, all in all this is somewhere we will definitely want to stay next time we are in Florence. (Text automatisch übersetzt) in einem Umkreis von 100 Metern finden Sie die besten Restaurants, die meisten "berühmten Sehenswürdigkeiten und Museen und Geschäfte von den besten Designern.